Sen. John McCain of Arizona said Trump made a "conscious choice to defend a tyrant"
In an extraordinary embrace of a longtime U.S. enemy, President Donald Trump on Monday openly questioned his own intelligence agencies' firm finding that Russia meddled in the 2016 U.S. election to his benefit, seeming to accept Russian President Vladimir Putin's insistence that Moscow's hands were clean. The reaction back home was immediate and visceral, among fellow Republicans as well as usual Trump critics. "Shameful," ''disgraceful," ''weak," were a few of the comments. Makes the U.S. "look like a pushover," said GOP Sen. Bob Corker of Tennessee. His remarks, siding with a foe on foreign soil over his own government, was a stark illustration of Trump's willingness to upend decades of U.S. foreign policy and rattle Western allies in service of his political concerns. A wary and robust stance toward Russia has been a bedrock of his party's world view. But Trump made clear he feels that any firm acknowledgement of Russia's involvement would undermine the legitimacy of his election. "He just said it's not Russia. I will say this: I don't see any reason why it would be," Trump said. His skepticism drew a quick formal statement — almost a rebuttal — from Trump's director of national Intelligence, Dan Coats. 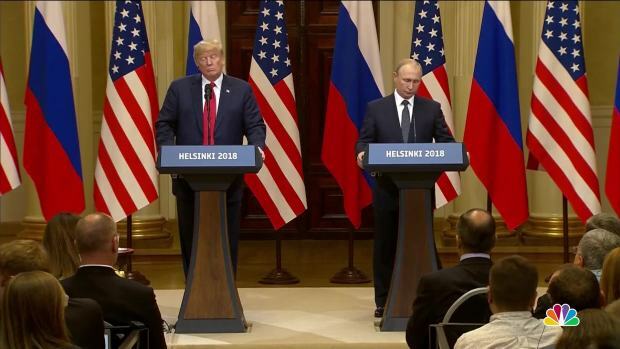 Fellow GOP politicians have generally stuck with Trump during a year and a half of turmoil, but he was assailed as seldom before as he returned home Monday night from what he had hoped would by a proud summit with Putin. Sen. John McCain of Arizona was most outspoken, declaring that Trump made a "conscious choice to defend a tyrant" and achieved "one of the most disgraceful performances by an American president in memory." House Speaker Paul Ryan, who rarely criticizes Trump, stressed there was "no question" that Russia had interfered. Even staunch Trump backer Newt Gingrich, the former House speaker, called Trump's comments "the most serious mistake of his presidency" and said they "must be corrected — immediately." Former CIA Director John Brennan, who served under President Barack Obama, called Trump's words "nothing short of treasonous." Brennan tweeted: "Not only were Trump's comments imbecilic, he is wholly in the pocket of Putin. Republican Patriots: Where are you???" In a Fox News Channel interview after the summit, Putin pronounced the meetings "the beginning of the path" back from the West's past efforts to isolate Russia. "I think you see for yourself that these efforts failed, and they were never bound to succeed," he said. As he flew home to Washington aboard Air Force One, Trump tried to clarify his position via tweet, saying: "As I said today and many times before, 'I have GREAT confidence in MY intelligence people.' However, I also recognize that in order to build a brighter future, we cannot exclusively focus on the past - as the world's two largest nuclear powers, we must get along!" In an interview with Fox News' Sean Hannity that aired later Monday, Trump said "it's a shame" that he and Putin were being asked questions about the Russia probe while they were trying to discuss issues like Syria and nuclear proliferation. "We've had a phony witch hunt deal drive us apart," he said. In their totality, Trump's remarks amounted to an unprecedented embrace of a man who for years has been isolated by the U.S. and Western allies for actions in Ukraine, Syria and beyond. And it came at the end of an extraordinary trip to Europe in which Trump had already berated allies, questioned the value of the NATO alliance and demeaned leaders including Germany's Angela Merkel and Britain's Theresa May. The two leaders' long-awaited summit began with a private face-to-face sitdown — just the leaders and their interpreters — that lasted more than two hours, before additional meetings joined by senior aides. The pair had held lengthy talks before — on the sidelines of world leader meetings in Germany and Vietnam last year — but this was their first official summit and was being watched closely, especially following the announcement Friday of new indictments against 12 Russian intelligence officers accused of hacking Democratic emails to help Trump's campaign. Asked about the indictments, Putin suggested that Moscow and Washington could jointly conduct the investigation, inviting special counsel Robert Mueller's investigators to come to Russia to interview the 12 people — an idea Trump hailed as an "incredible offer." Putin said he'd expect the U.S. to return the favor and cooperate in the Russian probe against William Browder, a British investor charged with financial crimes in Russia. Browder, an outspoken Putin critic, was a driving force behind a U.S. law targeting Russian officials over human rights abuses. The Russian foreign ministry responded by liking Trump's tweet and then replying, "We agree." 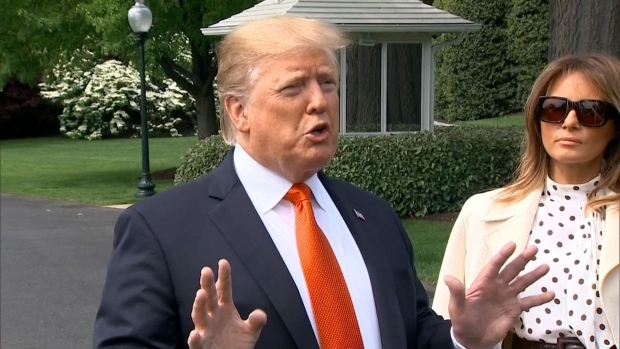 Asked whether Russia was responsible at all, Trump said "we're all to blame" for the soured relations. However, "that changed," he said, "as of about four hours ago." Putin ridiculed as "sheer nonsense" allegations that Russian intelligence agencies had collected compromising information on Trump during his visit to Moscow years before the election, saying that he had no idea Trump was even visiting. Trump also dismissed the idea in his interview with Hannity, adding, "If they had it, it would have been out." Still, Putin said he had indeed wanted Trump to win the election — a revelation that might have made more headlines if not for Trump's performance — but had taken no action to make it happen. At the closing press conference, Putin, riding high after hosting a successful World Cup, unveiled a gift he'd brought for Trump: a red and white soccer ball, which he tossed to Trump at the neighboring lectern. Trump passed it over to his wife, and said they'd give it to their soccer-loving 12-year-old son, Barron. Out on the streets, the summit attracted a grab-bag of protesters, with abortion-rights activists wearing artificially bulging bellies and Trump masks, anti-fascist protesters bearing signs with expletive-laden insults, and free traders, anti-war Ukrainians and gay rights supporters making their voices hear.